We all know that wine comes from grapes, but what I didn’t know is that grapes are used in skincare too! 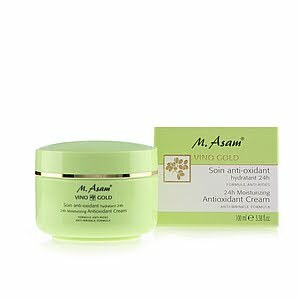 M. Asam Vino Goldis a European luxury cosmetics company that has been using grapes in their products because of its many wonderful qualities as an antioxidant and for its anti-aging properties. I had the opportunity to try three specialty anti-aging products from M. Asam Vino Gold: Perfect Teint, 24H Moisturizing Antioxidant Cream and Magic Fini. 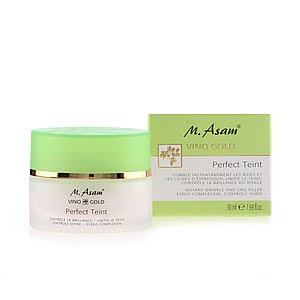 Perfect Teint is an instant wrinkle and line filler that evens out your complexion and give you a flawless, satiny-smooth, matte finish. I applied a small amount to my fine lines around and in between the eyes as well as fine lines around my mouth. I don’t really have many lines or wrinkles yet, but I did like that it went on so smoothly and left zero residue. It is like a powdery finish so you won’t be all shiny even if you applied this product to your entire face. I believe it did soften up my eyes a bit. It costs $52 for a 50 ml jar. Next up was the 24h Moisturizing Antioxidant Cream that reduces the appearance of lines and wrinkles, moisturizes, and leaves your skin feeling soft and supple. It can be used on any skin type and any age of skin. I also liked this product because it did leave a matte finish like I had applied something to soak up the shiny look. It surprised me a bit as a moisturizer, I was expecting it to be a little greasy until it absorbed, but that was not the case at all. The texture is very unique and I love the end result. Soft and smooth. It costs $32 for a 100 ml jar. To finish off the set is Magic Fini, which is a concealer for uneven skin tone, wrinkles, and enlarged pores. I was nervous opening the jar because it looked really dark and I was worried that it would make me look orange. I am very pale, but I thought what the heck, I will try it anyways. I can always wash it off if it is too dark. So I took a deep breath and tentatively applied some of the product to my cheek and began to blend. It applies so beautifully and again, the texture is great-silky and soft. But what surprised me the most is the colour was actually perfect for me. I only needed a little bit because of my fair skin and that was the right amount for me to create the perfect, sun-kissed, natural look. I didn’t need to use any powder afterwards because of the matte finish. So as you can see, I was pleasantly surprised and blown away that the colour looked awesome on my skin!This product can be used for light to medium to full coverage depending on its application. It costs $49 for a 30 ml jar. These sound Heavenly!! Love your blog! Thanks for helping me celebrate my SITS day yesterday! I had the BEST Blogging day EVER!! Btw, coming over from blogfrog. Hi Stacie! Happy Tag Tuesday! I hope your week is going along great!